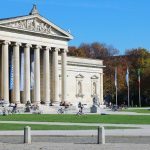 The "English Garden Tour" will show you everything from Monopteros to the Eisbach, the Chinese Tower, Kleinhesseloher See, the teahouse and the surfers at Prinzregentenstrasse, all of which make the park so worth seeing and endearing. 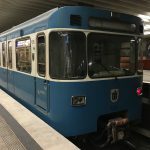 The best way to start with the U3 or U6 at Marienplatz and leaves the subway again at the University Station. Take the exit "Professor-Huber-Platz" and turn behind the fountain into Veterinärstrasse. Just go straight and you're at your destination in just 5 min. 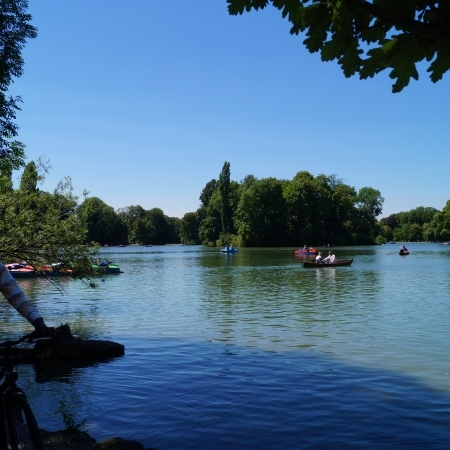 The English Garden is one of the 375 hectares largest parks In the world, with 78 km paved roads, there is ample opportunity for walking, jogging or cycling. 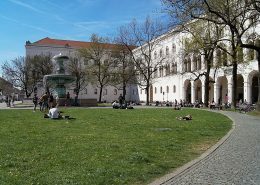 Friedrich Ludwig von Sckell In the design of the park, the English landscaped gardens became the model and gave the park its catchy name. Whereas in former times the parks were reserved for the nobility, the English Garden was one of the first parks to be entered by anyone. Today, the park, which by the way is one of the largest inner-city in the world, counts around 3,5 millions of visitors annually. Through the Isarring, a four-lane section of the so-called Munich Ring, the garden is divided into a southern and a northern part. According to the latest plans, the Isarring is to be laid in a tunnel and thus the two parts of the garden are brought together again. On the 13. 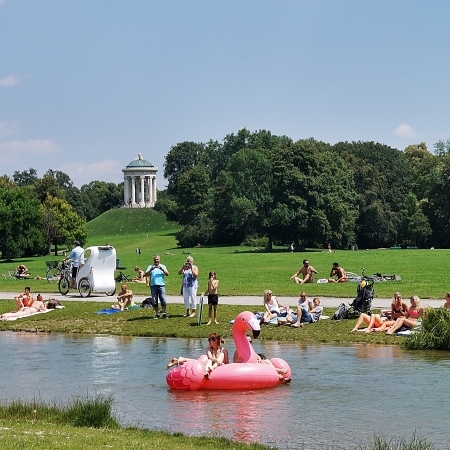 August 1789 ordered Elector Karl Theodor, the area east of the Munich Military Gardens in one people's Park convert. Today, this date is commonly regarded as the actual founding of the English Garden in its present form. It was the first plant of its kind in Europe. The execution of the garden was the responsibility of the court gardener Sckell, while the overall responsibility remained with the Bavarian Minister of War Benjamin Thompson, later Reichsgrave of Rumford. In addition to the lush greenery of the English Garden is characterized by its waters. 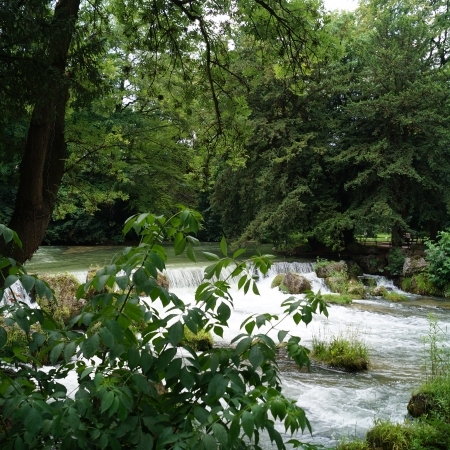 At the southern end of the English Garden, the Schwabinger Bach and the Eisbach enter the park, unite and then flow separately again. 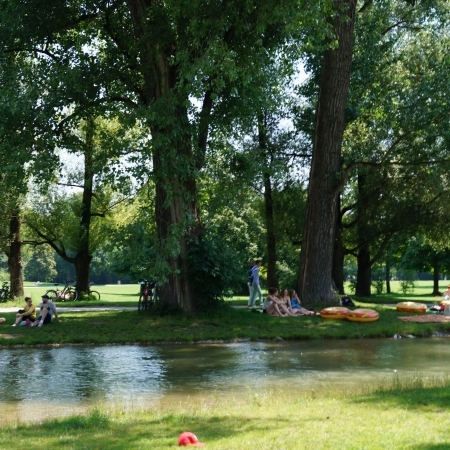 From the Eisbach branches of Oberstjägermeisterbach so that a large part of the English Garden is crossed by three approximately parallel streams. 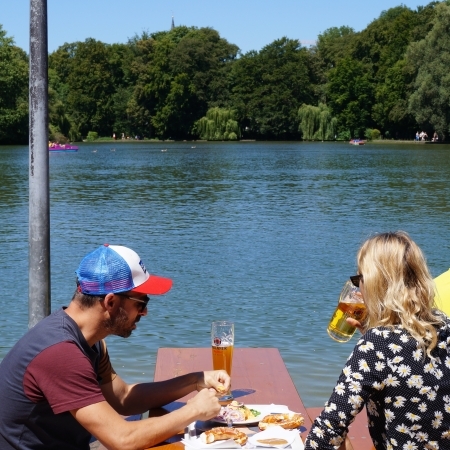 Immediately south of the Isar ringseparating the northern part from the southern part of the English Garden, is 1803 8,64 acres Kleinhesseloher lake with the lake house, a fantastically beautiful beer garden. The third element in addition to the planting and the waters are the buildings in the English Garden. Rumford houseAlso Rumford Schlössl is a Classicist building in the southwest of the garden and was named after the Imperial Earl of Rumford, sir Benjamin Thompson, named. It was first used as an officer's casino and later for courtly purposes. The Hall of Mirrors was a place of glittering dinners with up to 150 guests. 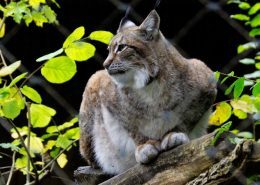 Today it is known by the name "Natur- und Kulturtreff". The model for the Chinese Tower was the double-sized "Great Pagoda" in the royal palace garden Kew Gardens in London, which was based on a Majolikapagode in the gardens of a Chinese emperor. The Chinese tower is the second largest with 7.000 seats Munich beer garden, During the Advent season, a small Christmas market is held here and since 1989 again every year the Kocherlball instead. Near the Chinese Tower is a popular children's carousel in the style of the Biedermeier period, which is open in good weather. 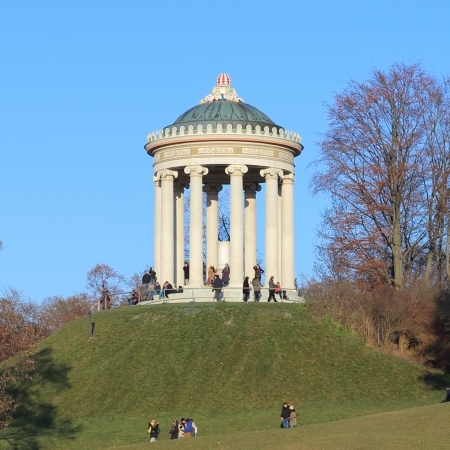 One of Munich's probably most photographed motifs is the Monopteros. 1831 was the decision to build a round temple, one monopteros, caught, started work one year later. The about 16 meter high round temple in the classical Greek style was designed by Leo von Klenze built of Kelheim limestone. 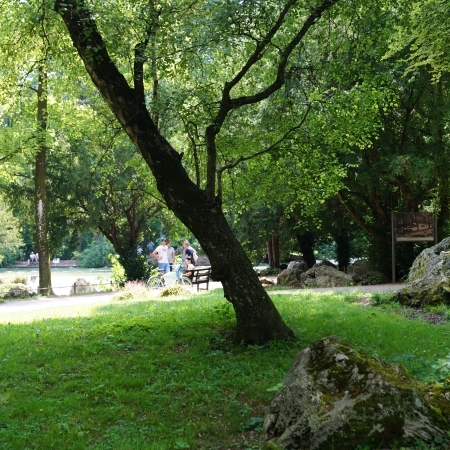 The hill of the Monopteros developed in the 1960er years to the meeting point of alternatives, artists, hippies and "bums". 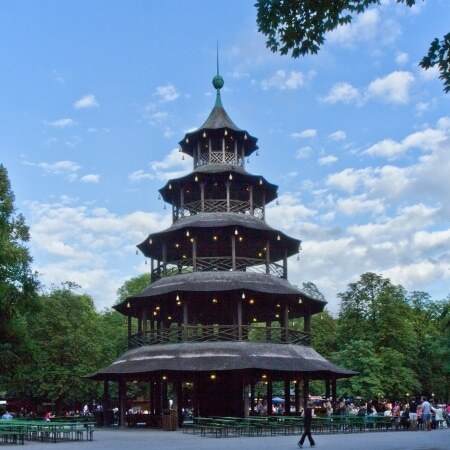 On the occasion of Summer Olympics 1972 in Munich and the city twinning with the Japanese city since then Sapporo, a Japanese teahouse and a Japanese garden were created on a small island at the southern end of the English Garden. The teahouse regularly hosts the traditional Japanese tea ceremony instead of. Every year on the third Sunday in July, a "Japanfest" is held. In the immediate vicinity of the tea house is the famous Eisbach wave. This is where the surfing scene meets all year round. Dare to venture into the water but only absolute professionals, swimming and swimming is strictly prohibited here. 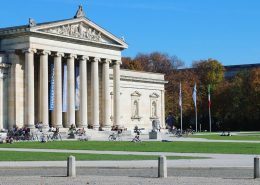 The best place to watch it is in the Prinzregentenstrasse, next to the Haus der Kunst. Here our today's tour comes to an end. Did you like the tour? Then I am pleased about your rating and comments. If you do not want to miss any of my posts, then subscribe to my blog.